This month OCFB interviews Lee Chilcote. Lee is founder and executive director of Literary Cleveland, whose mission is to “help create and nurture a vibrant literary arts community in Northeast Ohio.” Lee is a teacher, an essayist and journalist whose articles have appeared in national and international publications. And, Lee Chilcote is a poet. Lee’s first poetry collection, The Shape of Home (Finishing line Press, 2017), is a moving collection of poems that, among other themes, connects the us to the concept of home; how the experiences associated to home, while growing-up, influences us as we effect our own homes as adults. It was nominated for the Society of Midland Authors Award in Poetry. Next month his second collection, How to Live in Ruins (Finishing Line Press), will be released November 2018. OCFB: When did you begin writing poetry? LC: I started writing poetry in high school. Although I was writing short stories in middle school, in high school I discovered poetry through my English teacher at University School, Kevin Kay. We completed a poetry unit in which I read poems like “Those Winter Sundays” by Robert Hadyn (a Detroit poet), “Autumn Begins in Martins Ferry, Ohio” by James Wright (an Ohio poet) and others. I fell in love with their lyrical voices and that was it for me. As time progressed, I became interested in other genres of writing – songwriting, journalism and creative nonfiction. But I have always come back to poetry. 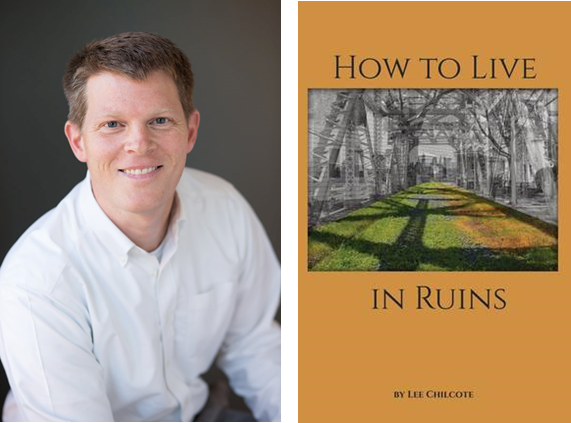 OCFB: Congratulations on the publication of How to Live in Ruins. Last year you published your first poetry collection, The Shape of Home and now your second collection will be released in November. Does the new collection expand upon the ideas present in the first? LC: My first collection braids together poems about growing up in Northeast Ohio with pieces about urban parenting, and the whole endeavor in set in a recessionary environment. I’m exploring themes of creating your own identity amidst the echoes and influences of the past. How to Live in Ruins tells the next chapter of the story – one couple moving into and raising kids in the Detroit Shoreway neighborhood of Cleveland, a place that might appear “ruins” when viewed from the outside. The poems grapple with challenges facing urban neighborhoods like crumbling schools, homelessness, people losing their homes to foreclosure. They’re personal but also political. OCFB: You grew up in Cleveland Heights. Having broached the theme of home in your writing, how has being native to, and living in a city like Cleveland shaped your work? LC: Cleveland is my muse. My great-grandfather on one side of my dad’s family, who had an eighth-grade education, came here looking for work in 1900 and started a company. My grandmother on my mom’s side helped prevent the Shaker Lakes from being paved over for a freeway. My parents were always involved in urban revitalization, from when I was very young. I grew up surrounded by the city’s history – my parents’ English Colonial in Cleveland Heights has secret closets under stairways that are perfect for hide-and-seek and enormous elms that stretch their cathedral-like arms into the sky and inspired my daydreaming. In a way, How to Live in Ruins is the next leg of that story – it’s about moving into the city as an adult and being part of its resurgence when historically, my family, like so many families, had moved in the opposite directions, towards the suburbs and way from urban neighborhoods. OCFB: Besides being a poet, you are a journalist and essayist; as a founder and Executive Director of Literary Cleveland, you run a nonprofit that serves Northeast Ohio’s writing community–and you are a family man. How do you carve out time to write and to put together a poetry collection? LC: It’s very difficult. That’s why I’ve decided to step down as executive director of Literary Cleveland – to focus more on my family, teaching and writing. However, I’ve been fortunate to work with wonderful colleagues and board members over the past four years. And while some writers have posited that having children can take away from your writing, and I’m well aware that my career is on a slower track because of my family commitments, I’m very happy. OCFB: As a poet, who are your influences? Who or what inspires you most? LC: Great question. I don’t know if I have a good answer, but I think there’s a documentary element to all of my writing and that my poems have an essayistic approach. For example, my poem “In Recovery” in How to Live in Ruins is a prose poem about a guy I met named Bruce who had formerly been a homeless drug addict. That’s a poem that blurs the line between poetry and reporting / micro-essay. OCFB: Journalism and creative writing are opposing ends on the writing spectrum. How does being a journalist affect your poetry? LC: I love poets like Robert Frost, Rita Dove, George Bilgere, Billy Collins and Natasha Trethewey. Admittedly, I have a lover’s quarrel with some contemporary poetry. Much of the poetry published in journals like Poetry just isn’t for me. That’s not a qualitative judgment but a personal one. In my heart, I’m still the little kid reading with a flashlight under the covers to find out what happens – my favorite poems contain elements of lyricism combined with good storytelling. OCFB: Any advice for those new to writing? LC: Stick with it. Don’t expect it to be fun. It’s hard work but very rewarding. And seek out advice and help wherever you can, so you don’t get too locked into bad habits and circular thinking. Read as widely as you can, but don’t feel like you “have” to read anything – read what you love and what inspires you even as you challenge yourself to read new work. OCFB: I’ve read that to see the world with complete honesty, one should look to comedians, artists and poets. What do you want readers to take from your poetry? LC: I think I’ll leave this to the reader to decide! However, with this book in particular, I hope it helps spark some honest conversations about Cleveland and the issues facing urban areas. No city can “recover” until it faces up to the challenges of all of its residents, including poor and minority communities not benefiting from current revitalization efforts. That’s reality.